Detergents constitute a wide range of household washing and cleaning agents used for laundry and dish. They are complex chemicals that are classified into anionic, cationic, and non-ionic detergents. Detergent Poisoning is the accidental or intentional intake of detergent products. What are the Causes of Detergent Poisoning? What are the Signs and Symptoms of Detergent Poisoning? How is First Aid administered for Detergent Poisoning? Who should administer First Aid for Detergent Poisoning? 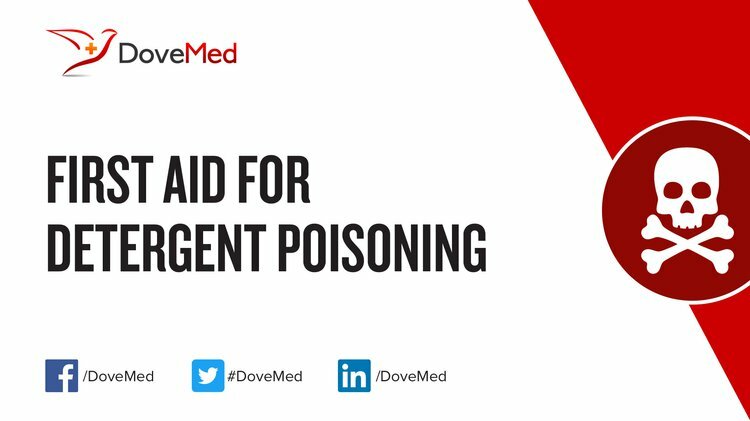 First aid for Detergent Poisoning is administered by healthcare professionals. What is the Prognosis of Detergent Poisoning? How can Detergent Poisoning be Prevented? Centers for Disease Control and Prevention (CDC. (2012). Health hazards associated with laundry detergent pods-United States, may-june 2012. MMWR. Morbidity and mortality weekly report, 61(41), 825. Valdez, A. L., Casavant, M. J., Spiller, H. A., Chounthirath, T., Xiang, H., & Smith, G. A. (2014). Pediatric exposure to laundry detergent pods. Pediatrics, 134(6), 1127-1135. Bonney, A. G., Mazor, S., & Goldman, R. D. (2013). Laundry detergent capsules and pediatric poisoning. Canadian family physician, 59(12), 1295-1296. Dart, R. C., Bronstein, A. C., Spyker, D. A., Cantilena, L. R., Seifert, S. A., Heard, S. E., & Krenzelok, E. P. (2015). Poisoning in the United States: 2012 emergency medicine report of the National Poison Data System. Annals of emergency medicine, 65(4), 416-422. Kawamoto, O., Ishikawa, T., Oritani, S., Kuramoto, Y., Michiue, T., & Maeda, H. (2013). Death following the ingestion of detergent: an autopsy case with special regard to the histochemical findings. Forensic Science, Medicine & Pathology, 9(2). Davis, M. G., Casavant, M. J., Spiller, H. A., Chounthirath, T., & Smith, G. A. (2016). Pediatric exposures to laundry and dishwasher detergents in the United States: 2013–2014. Pediatrics, e20154529. Tang, K. T., Hsieh, C. W., Hsieh, T. Y., Lan, J. L., Chen, Y. H., & Chen, D. Y. (2015). Suicide attempts in patients with systemic lupus erythematosus: a single-center experience and literature review. Psychosomatics, 56(2), 190-195. Swain, T. A., McGwin, G., & Griffin, R. (2016). Laundry pod and non-pod detergent related emergency department visits occurring in children in the USA. Injury prevention, 22(6), 396-399. Furukawa, S., Morita, S., Nishi, K., & Hitosugi, M. (2014). A case and review of death associated with ingestion of detergent. Forensic Medicine and Anatomy Research, 2(04), 89. Williams, H., Bateman, D. N., Thomas, S. H., Thompson, J. P., Scott, R. A., & Vale, J. A. (2012). Exposure to liquid detergent capsules: a study undertaken by the UK National Poisons Information Service. Clinical toxicology, 50(8), 776-780.